Friends of Merlin Woods has organised a series of events to help people enjoy a natural December, help them step outside, to enjoy the peace and enjoyment nature can offer at this hectic time of year. The first of the group’s events organised for this month is a big litter pick, which will gather people together to return the woods to a beautiful litter-free state, which in turn will make walking there so much more enjoyable. This will take place on Sunday December 3 and everyone is invited. Gloves and bags will be provided. The meeting point will be at the Merlin Woods Community Garden, at the Doughiska entrance to the woodland, from 12 noon to 2pm. On Wednesday December 6 An Evening with Fionn and Jonathan Angus will be held at the nest area in Merlin Woods from 7pm to 8pm. 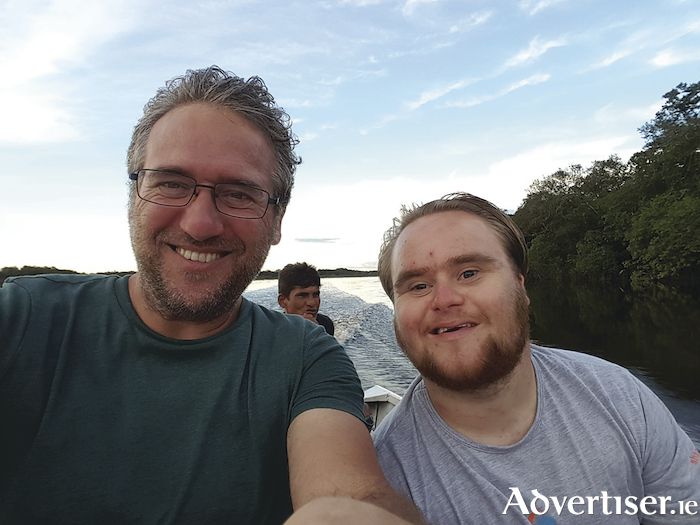 As a child Fionn Angus had his heart set on becoming the next David Attenborough, and his father Jonathan wanted him to see that living with Down syndrome would be no obstacle to his realising his dreams and having a great life. They set up Fionnathan Productions, a social enterprise that works in arts, media, and education. Catherine Denning will interview the pair, opening a conversation on the work they do with Heritage in Schools programme, educating children on the natural world around them. Delve into their exciting life of travel all over the world, from visiting the Amazon and catching piranhas to watching grizzly bears catch salmon before hibernation in British Columbia, and much more. The nest area is situated near the Merlin Lane entrance to Merlin Woods. On Sunday December 17 from 4pm to 5pm, following the success of last year’s event, the return of The Hearth of Winter brings the community of the woodland together to give a little back to nature. Focusing on sustainable use of waste, using recycled bird-feeders made from plastic bottles or other containers, and fruit such as melons or coconuts shells, they will decorate the trees at the roundabout area. A simple light display on the trees will be lit on the evening, music and songs will take place, and individuals, families, groups, and schools are invited to attend and participate. John Lusby of BirdWatch Ireland will be on hand to chat about the birds and animals that will use the feeders, and what people can do in their own gardens to encourage and feed birds during the harsh winter months. Debbie Reilly will be on hand with handmade recycled wooden platters that can be filled with seeds, apple, and nuts that will also decorate the trees. Everyone is encouraged to have a go at making his/her own recycled feeder and to bring it along on the day. Some seed and feed will be available to fill the feeders. A song written especially for the day will be performed by groups and individuals coming together and everyone is encouraged to sing along. This will take place at the roundabout area on the main path of Merlin Woods. These events have been organised with the aid of European Green Leaf funding. All events are accessible to buggies and wheelchair users. Attendees are asked to wear appropriate clothing and footwear for the weather. It is advisable to leave dogs at home as some people may have a fear of dogs. Public parking is available at Doughiska. The number 409 bus from Eyre Square will take you to the Doughiska road near Centra. Any queries on the events can be emailed to [email protected] or contact Caroline on 085 2484380.